Captain Michael Gladwin has over 25 years of experience in Bermuda waters and is a very competent skipper. He owns the largest custom boat which is 75-foot long, with 20-foot beam and having glass bottom and other custom features. If you take a night ride, they switch on the special sub-sea lights for night viewing of marine life. The boat can easily accommodate 150 passengers and has adequate safety equipment onboard. Reef Explorer has two open decks and bimini shades. The upper deck is great for viewing the scenery around as you sail along. The lower deck has a bar with soda dispensers. There are also restrooms and changing rooms on the lower deck. They have onboard snorkel equipment and kayaks. There is a small special platform attached at the rear end of the boat to facilitate easy access to the water. There are several cruises available from the Reef Explorer. This is a three hour tour. On the way the captain will share his knowledge of the island. Through glass bottom view you will see colorful coral reefs, lots of fish and marine life. You will also see the partially submerged shipwreck Vixen along the way. You will pass by the natural habitat of Atlantic green turtles where you can see lots of green turtles. And then they take you to Turtle Cove. Here too you can see Atlantic green turtles in sandy flats. At the cove you can swim and snorkel in waist deep water. Or alternatively you can join the guides for a safari to the Sea Garden of Bermuda, a water area where you can see a plethora of amazing marine life like groupers and large variety of fish and also colorful corals. Here you can participate in feeding turtles and fish. The operator will be giving you snorkel and other buoyancy equipment. If you can't swim, just take a kayak and float around. So there is an option for all. On the way back, they put on the music so that you can relax and take some refreshment if you want. It's a two hour tour. The route is similar to the snorkel adventure. The captain will share a lot of historical facts about Bermuda and how the pastel color houses with white limestone roofs have become a traditional architecture in Bermuda. You will see variety of fish, corals and other marine creatures once you reach the destination. They will also show you the partially submerged shipwreck Vixen along the way with its hull jutting out of the water. Then you will proceed to Turtle Cove to see the green turtles of the Atlantic before you return. This is a night time cruise that lasts for one hour and 30 minutes. They will take you to the Pirates Point of Bermuda. This is where the notorious pirates used to lure the ships passing by and loot them. On the way the captain will share thrilling stories of how piracy was once legal in Bermuda and one of the main sources of income in the island. They will take you to the lower deck and switch on the special sub-sea lights so that you can see reefs and fish that are rarely seen during the day time. You will also see a shipwreck that had fallen prey to the pirates and finally sank at the bottom of the ocean. This is a three and half hour tour that takes you along the beautiful north shore of Bermuda. On the way you will see many water facing houses and historical buildings of Bermuda. The Captain will provide a lot of information about Bermuda's history. The boat will anchor at the inlet of Flatts Village where you will be visiting the Bermuda Aquarium Museum and Zoo, a top tourist attraction of Bermuda. 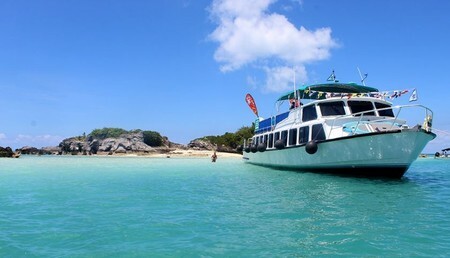 On your return, the boat will cruise to a shallow bay where you can have a refreshing swim, or kayak or even relax onboard while listening to music. $40.00 Adults, $20.00 children (6 years – 12 years), under 6 free. $45.00 Adults, $20.00 children (6 years – 12 years), under 6 free. The rates include complimentary rum swizzle for adults (over 18 years of age). $60.00 Adults, $30.00 children (6 years – 12 years) under 6 years free. Rate includes use of snorkel equipment, flotation devices, and kayaks. Charter Rate: $400 per hour. Office Address: Suite 251, 48 Par-la-Ville Road, Hamilton HM 11, Bermuda. The regular group tours operate from Hamilton. If your cruise ship is docked at the dockyard, you can take the Blue Route ferry and reach the Hamilton Ferry Dock in 20 minutes.